Here is a look at my initial mock draft for the 2019 season broken down into four parts and continuing with picks, 9-16. Click here for picks, 1-8. It might not look like it following a six-win season, but the Bills appear to be building something special in Upstate New York. The first two years of the Brandon Beane (GM)/Sean McDermott (HC) era should be considered a success, especially after snapping the franchise long 18-year playoff drought in year-one and finding a potential franchise quarterback in year-two (Josh Allen). Now, if they can just find a big-time pass rusher, a future No. 1 running back and an infusion of talent along the offensive line, they can move right past the rebuilding stage and on to contenders. If the Bills prefer to go with an offensive player first instead of an edge-rusher, look at one of three Alabama kids, RBs Damien Harris/Josh Jacobs or OL Jonah Williams. DE – The Bills pass rush has been a sore-spot since McDermott took over in 2017, even though they did improve from 27 sacks in 2017 to 36 last season. Jerry Hughes is a fine player, but he’s only totaled 11 sacks over the last two years and is set to become a free agent in 2020. Shaq Lawson has only produced 10 sacks since being taken in the first-round in 2016, while Trent Murphy will look to improve upon a four-sack season during his first in Buffalo. Murphy had 9 sacks with Washington in 2016 until an ACL injury forced him to miss the entire ‘17 season. This is a position on the roster that needs a young star to develop and it’s a great draft class to find one. RB – LeSean McCoy is another key veteran who will see his contract end after the upcoming season, and at age 30 it’s time for the Bills to find his future replacement. OL – The Bills offensive line has gone through some major changes with LT Dion Dawkins as the lone guy standing. The free-agents brought in are decent at-best and the team will be able to field an adequate unit this season, but they still need a talent upgrade at both guard spots and at right tackle. TE – With Charles Clay moving on to Arizona, former college converted receiver Jason Croom is slated to take over the top spot here. But Croom is still an unfinished product and the Bills can use some insurance. I think this pick comes down to either Lock or one of the top tight-ends from Iowa. There’s no doubt that Lock would be a reach here, but do we ever get through the first-round of a draft when a quarterback doesn’t go higher than expected? QB – Joe Flacco has three years remaining on his current deal, but with no dead money to worry about the Broncos can decide when to move on to a younger player as soon as their able. 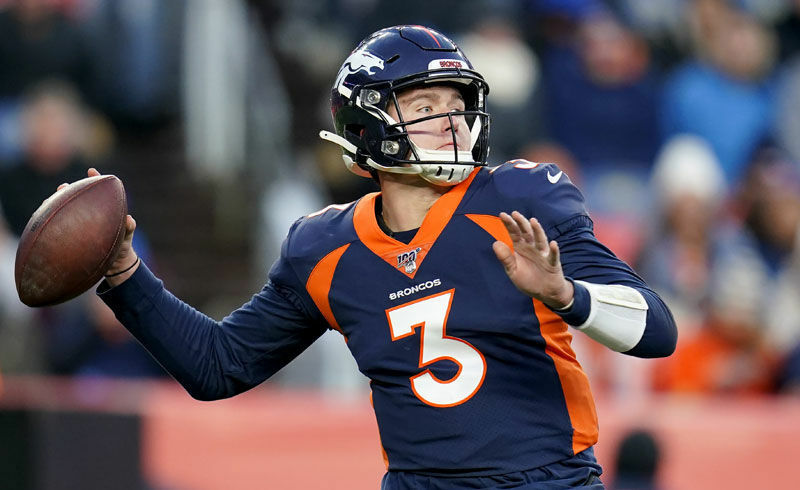 One way or another, whether through a pick or a trade (Jacoby Brissett/Josh Rosen), Denver will add a significant piece to the quarterback room and it will probably come during the draft. OL – This is all about the interior of the line after losing C Matt Paradis and guard’s Billy Turner and Max Garcia to free agency. It doesn’t help that one of their top linemen, RG Ron Leary, will have to return following an Achilles injury. TE – Not many quarterback’s in the league like throwing to their tight-ends more than Flacco and since three of their top tight-ends have injury histories, Denver might consider taking one at No. 10. WR – With 32-year-old Emmanuel Sanders coming off an Achilles injury in December and since he enters the final year of his current contract, the Broncos will probably add a receiver at some point during the draft. DL – Three key players will be entering their walk-years along the defensive line…DEs Adam Gotsis & Derek Wolfe and NT Shelby Harris. Since the Broncos are currently near the bottom of the league in cap space, they’ll probably need to add more depth here. Unless QB Dwayne Haskins falls down the draft board, I would expect the Bengals to use one of the later picks on a quarterback and continue the process of re-building their offensive line with their top selection. They should also consider going with LB Devin Bush here or possibly one of those Iowa tight-ends. QB –Andy Dalton has two year’s remaining on his 40 million dollar deal, but the Bengals can cut him loose and save the entire 40 million. If they smarten up and dump him, this position becomes priority No. 1. If they don’t, which is likely, then I still expect them to add a QB at some point during the draft. OL – The Bengals need bodies here and they need them fast. Last year they used their top pick on C Billy Price and I see no reason to believe they won’t take another lineman early again with the right-side of the line being the biggest culprit. LB – This is another unit that needs a near complete overhaul. No job should be safe. OLB Nick Vigil was better than the previous season, but he’s an average at-best defender who’s entering his walk-year while MLB Preston Brown underperformed in his first year after being signed away from Buffalo. Brown also injured his knee last season and missed the final seven games. RB – The Bengals need depth behind Joe Mixon, who doubled his production from his rookie season and was one of the lone bright spots on this team last year. They did select Mark Walton with their 4th-round pick last year, but he was arrested in February on a battery charge and was then subsequently waived. TE –Tyler Eifert might be getting another chance to stay healthy, but the Bengals need to bring in some more reliable insurance. With three picks in the first 44 the Packers should add at least two defensive players early. Bush is my top choice because he’s a rare talent for the position and is the type of player who can help transform the entire unit. The Packers will probably add a tight-end early too, but they might be able to get Noah Fant with their second pick or Irv Smith Jr. with their third. DB – The Packers have invested heavily in this area over the past two drafts and so far only CB Jaire Alexander looks like a solid long-term solution. I expect them to go down this well early once again to add another corner as well as a strong safety to compete with Josh Jones. Either way, I feel good about CB Byron Murphy or CB Greedy Williams being available when the Packers’ turn rolls around. TE –Jimmy Graham is on the tail end of his career and only tallied two scores last year out of his 55 receptions. The Packers need to look towards the future and can’t lose by going with either Noah Fant or TJ Hockenson with their top pick. ILB – The Packers lost starter Jake Ryan before the season last year and it doesn’t appear like they’ve found a sure-fire starter opposite Blake Martinez yet. That’s why this would be a great landing spot for Bush. OLB – Kyler Fackrell broke out last season with a team-leading 10 ½ sacks and the Packers added underrated free-agent Preston Smith from Washington. But in order to create more havoc from the outside, the team should probably try and acquire another player for this position. This roster might be the worst in football and with only two picks in the first 77, Miami needs to do whatever they can to trade down and accumulate more talent. No way should Jones go 13 and no way should four QBs get selected this early, but we all know picks this early happen all the time. If they don't with Jones, I'd also consider CB Greedy Williams and OT Jawaan Taylor. QB – The Dolphins should draft or trade for a quarterback this month. But it’s entirely possible they dump the season and set themselves up for one of the top signal-callers in 2020. OL – Wow! Outside of LT Laremy Tunsil, this unit is going to be downright awful. Another reason to wait until next season to find a young quarterback. DE – With Cameron Wake and Robert Quinn traded out of town and since 2017 first-round pick Charles Harris has only three career sacks, the answer to the obvious question is…Yes! They need pass rushers! WR - The Dolphins need a future No. 1 receiver. They also need depth. Who knows, maybe DeVante Parker will finally come through? Don’t count on it. The Falcons have some big contract decisions to make while currently ranking near the bottom of the league in cap space. How they decide to spend that cash and who they let go will have a major impact on their draft strategy. OL – After giving up 42 sacks and finishing near the bottom of the league in rushing, the Falcons need to use several draft picks to bolster the line including the right side which is the biggest culprit. With free-agent guards James Carpenter and Jamon Brown added to the roster, adding a right tackle could be their top priority. DL – With key contract decisions upcoming for Vic Beasley, Jack Crawford and Grady Jarrett, the Falcons need to add depth to the defensive line. After tagging Jarrett, the Falcons proved how much they value his abilities and will most likely lock him up long-term. But Beasley has regressed over the past two seasons after registering 15 ½ sacks in 2016 and will probably be one of the players Atlanta must decide to move on from. So with this being a very good class for edge-rushing talent, the Falcons might end up grabbing someone early. DB – With CBs Robert Alford and Brian Poole gone in free agency, the Falcons need to add at least one impact corner to this unit. They also need more safety depth with starters Ricardo Allen and Keanu Neal returning from serious long-term injuries. LB – This is another area that might lose a starter to free-agency after the season. I’m sure the Falcons will attempt to bring back star MLB Deion Jones, but after a down season from OLB De’Vondre Campbell and a down career so far from OLB Duke Riley, this is already an area that can use an upgrade. The Redskins have done a solid job re-building their defense by using their last two top picks on Alabama lineman. Now they have to start investing more quality in the back-seven while also hoping to land a dynamic big-play receiver. QB – The Alex Smith injury and his bloated contract puts the Redskins in a tough situation since no one really knows how he’ll respond when he returns. Because of this major question, Washington must be proactive and draft a developmental quarterback. The round in which they invest in for such a player is a separate question all together. WR – Since Pierre Garcon and DeSean Jackson left town following the 2016 season, the Redskins haven’t fielded anything close to a 1,000-yard receiver. Instead they’ve been relying on slot receivers, tight-ends and running backs to lead the way. 2016 first-round pick, Josh Doctson, hasn’t eclipsed the 600-yard mark yet, but he’s been doing a much better job improving his catch rate and might be able to keep improving with better quarterback play. Still, the Redskins should think long and hard about taking a difference-making talent early and they might be able to get their top overall choice at No. 15. OL – What an absolute injury mess this unit was last season. It was really shocking the Redskins didn’t implode any worse after losing both Smith and most of their line. If I had to pinpoint one specific position up-front that needs more graded beef, it has to be at guard where star RG Brandon Scherff will be coming off a pectoral injury and the current left guard spot is completely wide-open. DB – The Ha Ha Clinton-Dix trade did not work out for Washington. Instead, they signed SS Landon Collins and still have an opening at free safety. Knowing their affection for Alabama defenders, keep an eye on Deionte Thompson as a potential pick-up after the first-round. They also need to add some more corner depth. ILB – Unless two more former Alabama kids (Reuben Foster/Shaun Dion Hamilton) can claim the two starting inside spots long-term, which is a long-shot right now, the Redskins will need to add another player here. After a year of front office and coaching changes that produced a disappointing 7-9 season, not to mention having their franchise quarterback deal with a serious shoulder injury, the Panthers have to be excited about a re-set now that everyone has settled into their respective roles. Most important of course is to make sure QB Cam Newton is healthy. Then it’s up to G.M. Marty Hurney to work his magic and continue to add good young talent to a roster with a limited budget. That's why going with Williams would make sense since three of their corners are entering the market after the season. DE – Following a poultry 35-sack season and the retirement of Julius Peppers, the Panthers need to add at least one blue-chip edge-rusher to the mix and they couldn’t ask for a better draft class to find him. That's why DE Brian Burns would also be an excellent option with this pick. WR – Hurney made a good move by adding the dangerous DJ Moore in the first-round last year and the offense also benefited from Curtis Samuel’s return to full speed following a leg injury. With Devin Funchess gone and Jarius Wright getting way too much playing time, it’s clear the Panthers need to add another big-bodied starter to this unit. Keep an eye on players like Hakeem Butler, N’Keal Harry, DK Metcalf and JJ Arcega-Whiteside. LB – The Panthers added some depth to this unit last year, now they need to replace 14-year star, Thomas Davis. Last year’s 5th-round pick, Jermaine Carter Jr., might get first crack at the job, but with SLB Shaq Thompson entering his final contract year and the Panthers up against the cap, they’ll need to add at least one new significant player to this unit. DB – The Panthers used their second (CB Donte Jackson) and third-round picks (FS Rashaan Gaulden) last year to bolster the depth in their secondary. Now after parting ways with nickel corner Captain Munnerlyn and FS Mike Adams, and with CBs Ross Cockrell and Kevon Seymour returning from season-long injuries, this unit is going to need to add another two early-round picks once again. TE – This has to be Greg Olsen’s last season and Ian Thomas is a possibility to replace the 12-year veteran after a decent rookie campaign. But if the Panthers see someone like TJ Hockenson on the board as their best player at No. 16, they could very well go in his direction even though it might not be their most critical need.